Slayers is an AWESOME sword and sorcery (mainly sorcery) fantasy series chronicling the adventures of a 15-year-old super powerful female sorceress named Lina Inverse. It was originally published in novel format by Hajime Kanzaka with illustrations done by Rui Araizumi. Later, an anime TV series Slayers was made based on these novels. The second TV series Slayers Next aired the following year. As of April 4, 1997, the third TV series Slayers Try has begun! Slayers is basically divided into two storylines: Slayers and Slayers Special. In the Slayers series Lina's main companion is Gourry while in the Slayers Special series Lina travels with Naga. The Special (SP.) series describe the events which take place before those in the Slayers series, so there's no Gourry, Zel, Ameria, etc. For some reason, Naga disappears by the beginning of Slayers; I'm not sure why, but maybe we'll find out when Slayers SP. ends. SP. is serialized in the monthly Dragon Magazine; these are short stories by Hajime Kanzaka and Rui Araizumi which are later collected into the Slayers Special novels. However, the Slayers series consist of all full-length novels. There are currently 12 Slayers novels and 10 Slayers Special novels, as well as 4 MAGIUS Slayers RPG books. There is also one manga collection by Rui Araizumi and an ongoing Slayers manga series Chou-baku Madouden Slayers, currently 4 volumes long done by Shoko Yoshinaka. 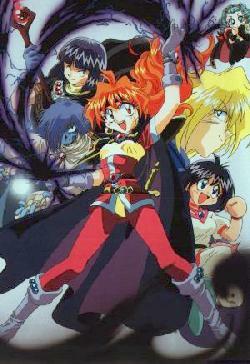 In addition to the TV anime series, there is a 3-part OVA series, Slayers Special, based on the SP. storyline. There have been 2 movies, also roughly based on the storyline of SP. in that Lina is younger and travels with Naga. The third movie Slayers Great is scheduled to start in theaters (in Japan) on October 2. The above description came from Lina Inverse's Slayers Page, and was edited by yours truly (contact me).